School was usually out for the summer by that date. The high school band was still intact to perform in the town parade, and all of the children with bikes and tricycles, and even wagons, were allowed to decorate their vehicles with red white and blue crepe paper stringers and flags and be in the parade. It was the traditional beginning of summer so we had three months of freedom to be kids before the burden of school began once more. Decoration Day always fell just two days before my birthday, which made it an even more special event. I remember the excitement of decorating my bike for the parade. I lived in a neighborhood with lots of other children so we usually got together with rolls of colored crepe paper and thought of creative ways to string the paper on our bikes. One year a boy in the group discovered a way to slip a playing card into the frame so that it made a flapping noise on the moving wheel spokes. We all rode in the parade that year making a rumbling noise. The parade was never very fancy but we loved it just that way. It was usually led off by a bunch of older veterans, squeezed into their old military uniforms and carrying flags. This was followed by the police cars and fire trucks with their sirens and lights on. After this marched the veterans of the World Wars, some in their old uniforms; all of them attempting to keep in step with one another. We still had veterans from the First World War living then. The school band was usually the next in the line. It was usually playing an old Sousa March or some other military sounding tune. Then came the convertibles with the mayor and other town dignitaries riding in them. We had a few famous natives still living then; Supreme Court Justice and former Michigan Governor Frank Murphy was still around then and he was born and raised in our town. It was a special honor if and when he showed up. We also had Jim Briske, who was the winning kicker in the Rose Bowl for the University of Michigan’s football team. At the time, people were as excited when he showed up as they were when Justice Murphy made an appearance. There sometimes were men and women riding horses. Then at the tail end of the parade came the bikes. We were always at the end of the parade and sometimes we had to dodge the horse manure. That never mattered to us. We were just excited to be in a parade. 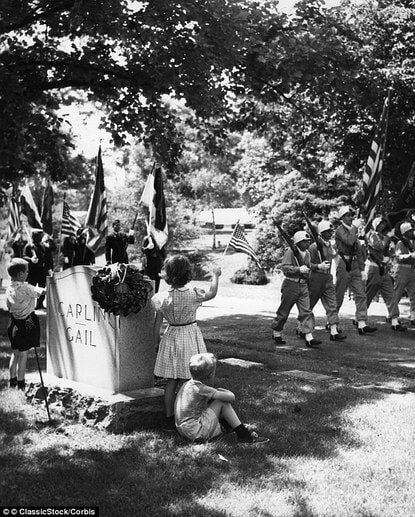 The parade marched through town and then everybody got in cars and buses for a ride out to Rock Falls Cemetery, located a mile or two south of town. For the children, that was the boring part of the event. It involved speeches and praying and all kinds of commemorations for the men and women who died in past wars. The tomb stones of the dead veterans were all decorated with little American flags. That is why they called it Decoration Day. All that has changed now. The legislators bowed to pressure from the resort industry to move the holiday to the last Monday of May so folks got a three-day weekend. That made it possible for them to get out of town for the holiday. They stopped participating in the parades and not many people showed up for the speeches at the cemetery. They changed the name of the holiday to Memorial Day. Schools came under pressure to make up lost days during winter storms, so classes sometimes continued until the middle of June. They also began holding school earlier in the fall so summer vacation time has been shortened to only about two months. Cases of child molestation and abduction have forced new laws so children have little or no time to run free like we did during the days of my youth. I doubt If many children know the art of decorating a bicycle with strings of colored crepe paper, or riding through town in a parade. Somehow the wonder of the Decoration Day holiday has been wrecked for this writer. I hardly notice it when the day comes along. This year it falls today, on May 28. And that just seems all wrong. After World War II we were very sincere when we took the time to remember and honor the men and women killed in that war. That was because it was a war the United States could not avoid. It was a time of real patriotism, when our fathers and grandfathers put on uniforms and went off to defend our country. At home we all sacrificed. The women went to work in the factories and things like tires, gasoline and sugar were rationed. Everything needed for the war effort went overseas to help the soldiers. Since then, war has become a product of the Military Industrial Complex. We send our young people off to fight wars that generate big profits for the firms that build war machines and furnish food and supplies for the soldiers in the field. We have an all-volunteer army. None of the wars have been fought in the defense of the nation although radio and television commentators still say it is so. The bodies that come home now are considered unfortunate casualties of war. When you think about it, they died for the corporations, not for the defense of the homeland. And that makes a big difference.